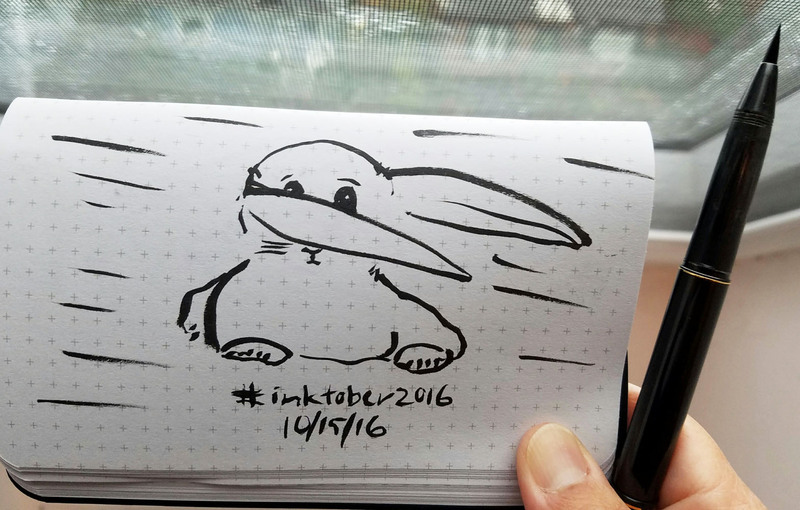 It’s Oct. 31, and that means it’s Halloween – but more important, it’s the last day of InkTober! 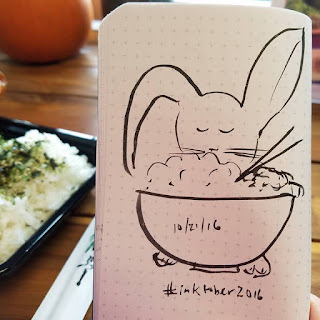 Last year I began InkTober without a theme or plan, but I ended up learning a few things anyway. This year I limited my materials and format, which was helpful, but I gave myself the added challenge of trying to draw more from imagination. 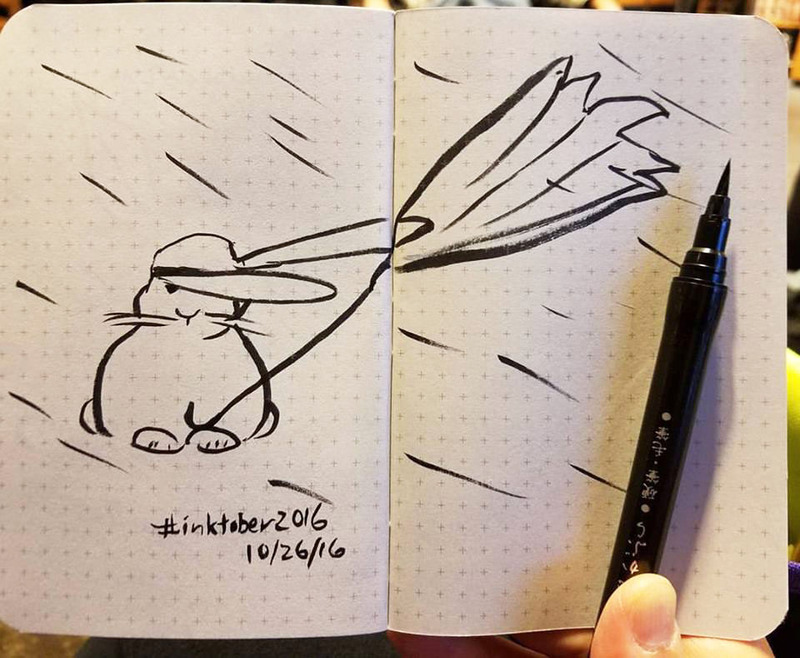 InkTober definitely became more fun when a theme finally emerged, and I didn’t have to pull a completely new idea out of my head each day. Paradoxically, it also became more challenging, because a rabbit reporting the weather could get boring fast! 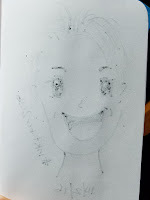 Coming up with a new single-image visual idea for a character every day is not easy. If I’ve gained anything from InkTober, it is a greater appreciation for daily newspaper cartoonists, who have to do it year-round, not just the 31 days of October. After seeing the adventures of Weather Bunny, a few of my Facebook and Instagram followers suggested that I could try my hand at cartooning. 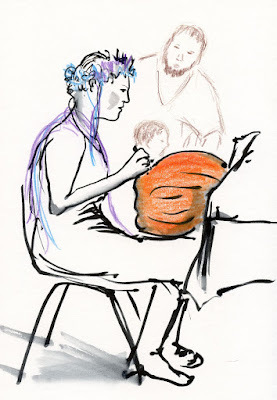 I can’t see that happening – I love drawing from life too much to devote time to developing visual fictional characters. 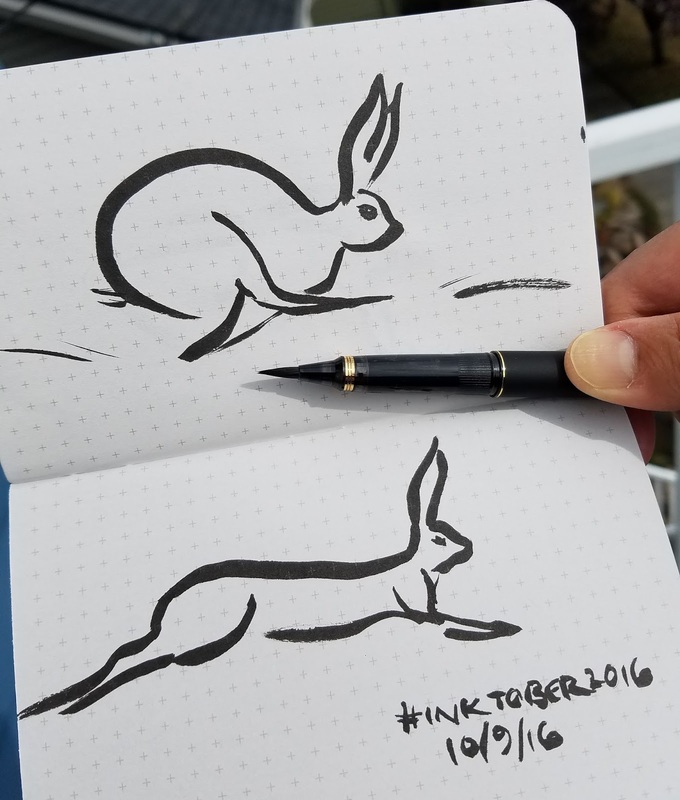 But I’m pleased that InkTober gave me an opportunity to discover what can happen when I challenge myself with something new and different. And yet there’s nothing new and different about it at all. The little cartoons I’ve been doing this month are very similar to the kinds I used to make so easily and regularly when I was a kid. I remember writing and drawing entire stapled-together books of characters and their stories that I had created. Somehow during the next five decades, I lost that ability. I’m grateful that it took only a month to get it back. How about you? 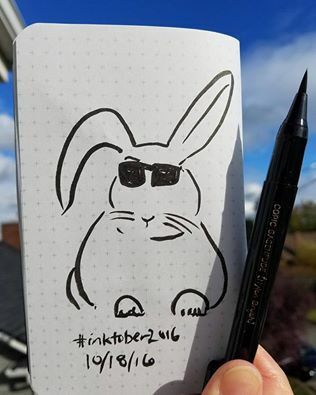 Was InkTober a fun challenge? What did you learn? And are you relieved that it’s over? When I was a kid, our Halloween tradition was to get a pumpkin from the grocery store. 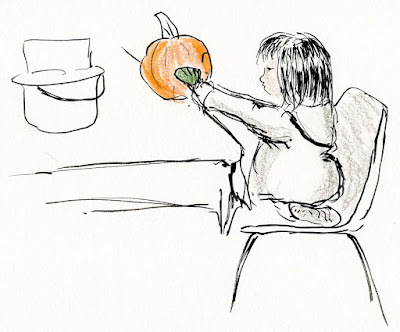 (Back then, the only choice was the ordinary orange kind – not the 76 varieties of stripes, spots, multi colors and gross warts that you can get now.) I would use a marker to draw the face. I hated the mess of cleaning out the guts, so my mom got stuck with that task. Finally my dad would use his pocket knife to carve my design. A candle would go inside, and our Jack-o-lantern would greet trick-or-treaters on the porch on Halloween night. Friday afternoon brought back those fun memories for me at the Northgate Community Center, which sponsored a free pumpkin carving contest. 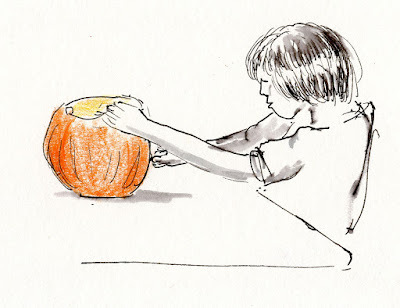 I get enough of cleaning out squash guts whenever we have them for dinner, so I declined on the free pumpkin. 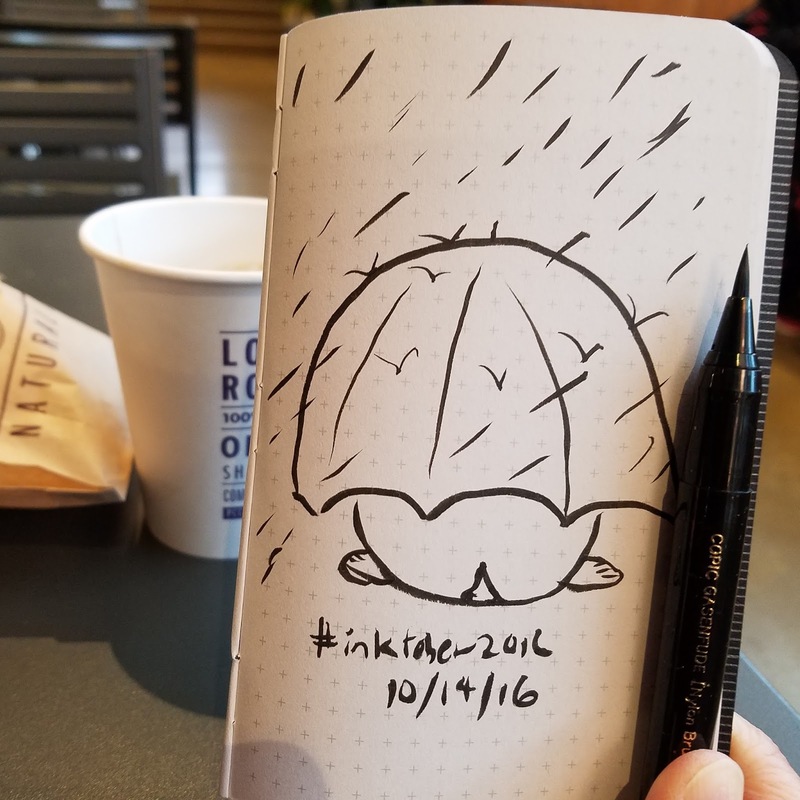 Instead, I brought my sketchbook. Wherever I looked, families were hard at work. I was impressed by all the kids who took their task very seriously. Wincing a bit, I watched a young girl wielding a grown-up knife to carve her pumpkin with much care and determination. Another young girl held a paint brush in each hand to decorate hers. Some kids simply enjoyed scooping out pumpkin innards with their bare hands. Children weren’t the only ones being creative. 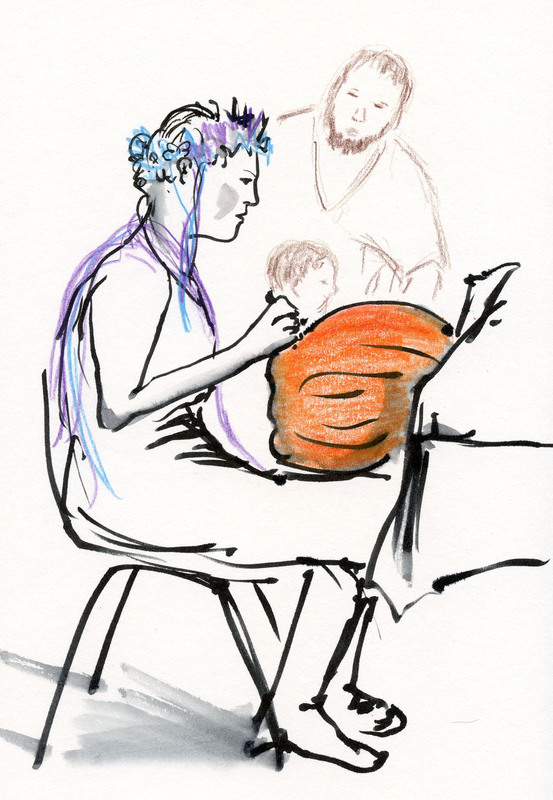 While dad entertained the child, a mom wearing a festive fairy tiara plopped a huge pumpkin in her lap and followed a design worked out on paper as she carved. Since I don’t have any young kids in my life, this is the kind of community event I probably would have skipped before I became a sketcher. But with my sketchbook, I got to join the fun – without all the sticky pumpkin guts. 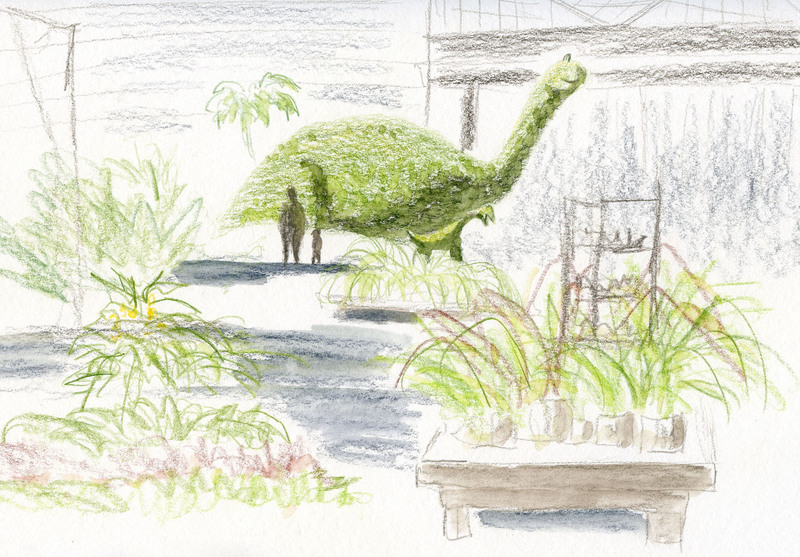 Swansons Nursery has been a favorite location for the Friday sketchers for several years now. A mainstay during the holidays when it brings in reindeer, camel and Santa, Swansons was also fun last spring. Now we have a new season to add to our Swansons lineup: Halloween! Decked out in plenty of pumpkins and fall décor, the north Seattle plant nursery also has adorable Nigerian dwarf goats and a hay maze. 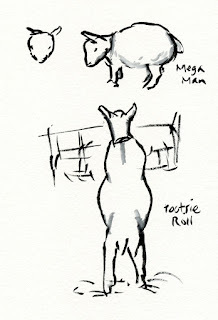 At the beginning of the meetup, I went over to the goat pen first and had it nearly to myself. 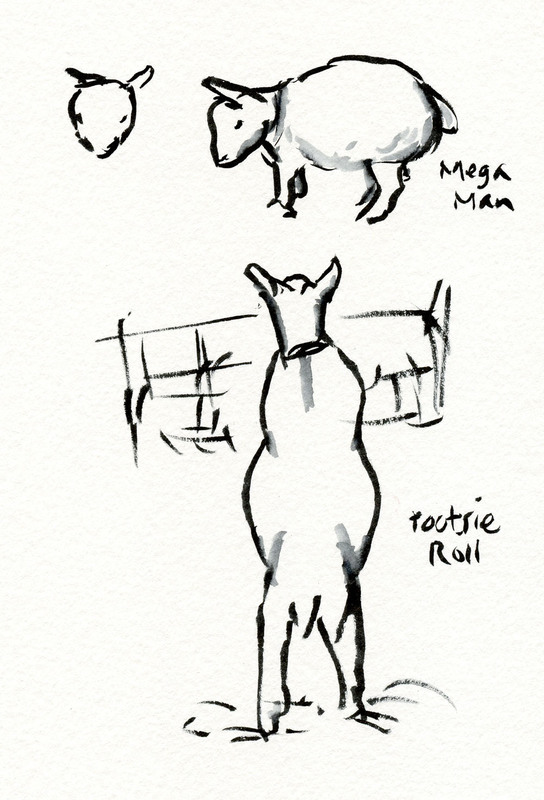 I took advantage of the relative quiet to do several studies of Tootsie Roll, Buttermilk Pancakes and tiny Mega Man. 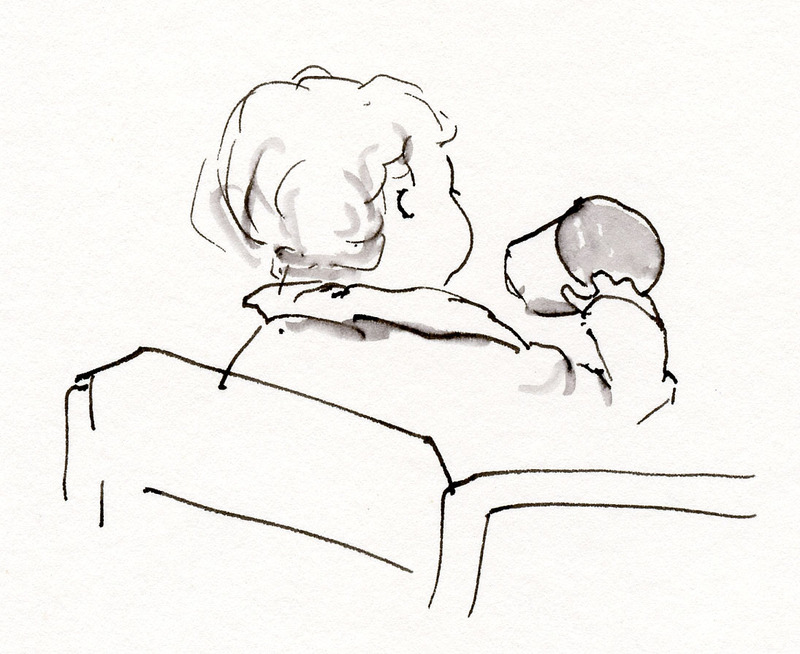 When I went into the café for a break, a toddler at the next table caught my eye. 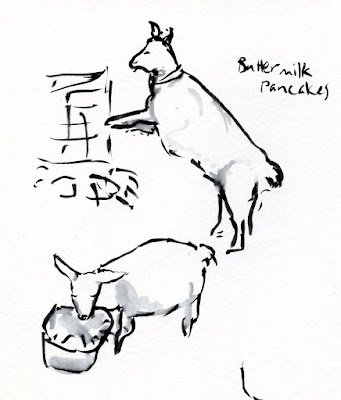 If I thought the constantly moving dwarf goats were a challenge to sketch, they couldn’t hold a candle to this little guy, who gave me about 5 seconds to catch this pose. 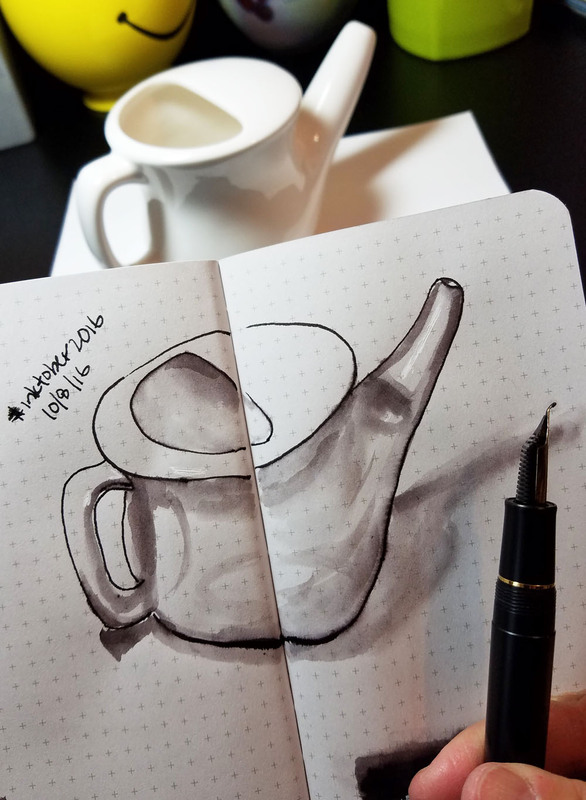 Yesterday at Gage life drawing, I alternately used two very different drawing tools: One was a Pentel Color Brush, which is one of my favorite brush pens for life drawing because the reservoir puts out an even flow of ink and keeps the brush tip juicy for loose drawings. It’s very similar to using paint except more convenient. 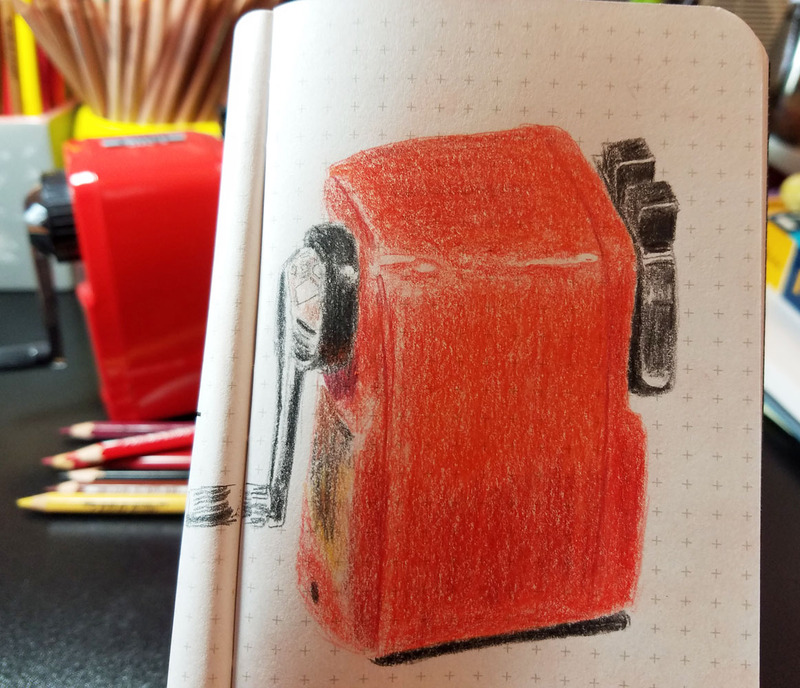 The second was a graphite pencil, but it’s amusingly called a “brush pencil.” Made by Uni Mitsubishi, its grade is 10B, and I think it’s the softest graphite pencil I’ve ever used. It’s not as soft as charcoal, of course, but it’s still soft enough that I could smudge it lightly with a finger for shading without making too much of a mess (my biggest complaint about charcoal, which I detest, is the huge mess it makes). 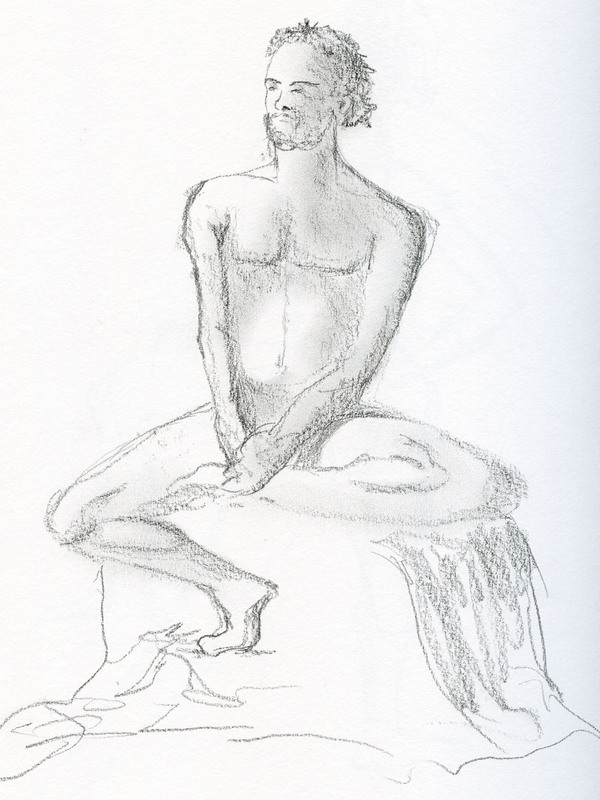 I generally prefer liquid media when the model is doing really short poses, but the “brush pencil” is so soft that it glides over paper very quickly, almost like liquid. I’m not a huge graphite fan, but I like this pencil a lot. The rainy season has begun. In the fall, we sometimes have rain in the morning that dries up in the afternoon and even yields to sunshine. But most of the time, not. 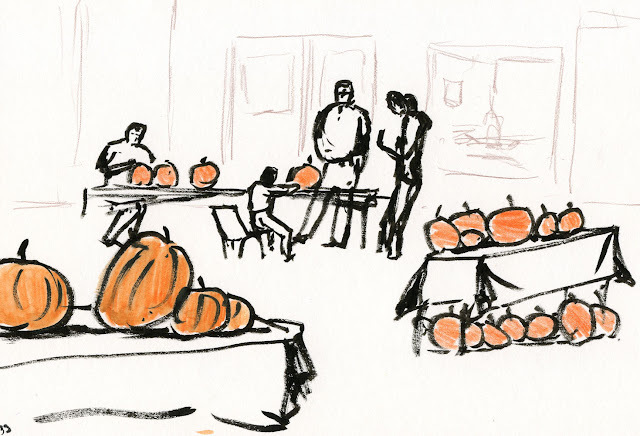 From here on out, you’ll be seeing plenty of still lifes, life drawing and interiors. The crescent die-cut cover of Field Notes' Lunacy edition. 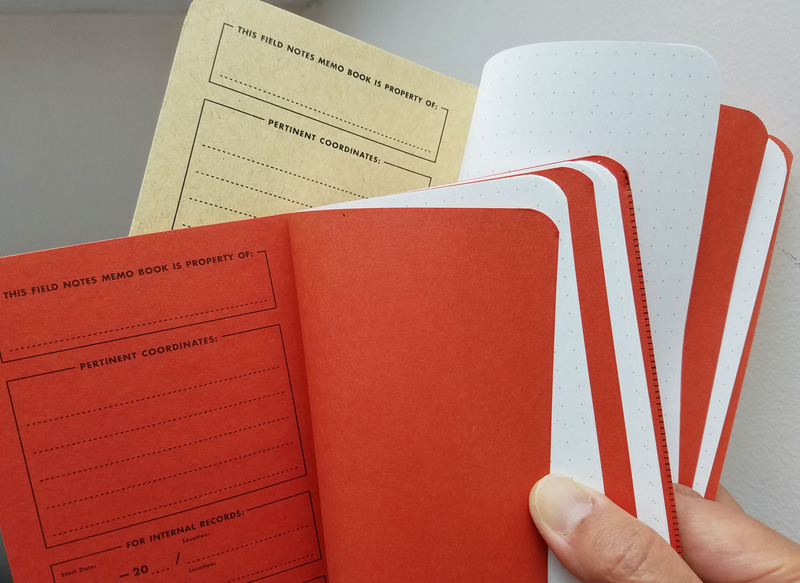 I’ve come to learn that even notebook formats that seem unappealing at first glance turn out to be full of opportunities, as long as I’m open to them, so I’m no longer disappointed when these little notebooks don’t have exactly the right paper for my needs. 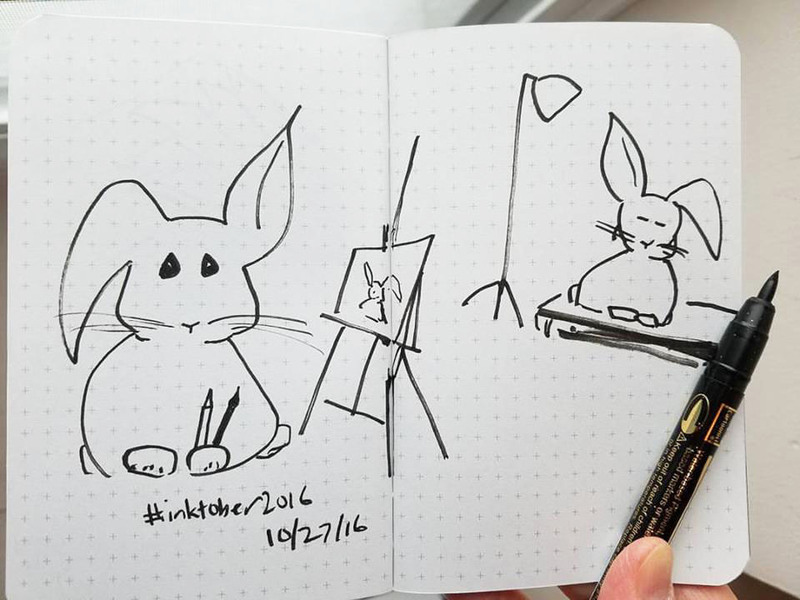 To my delight, Field Notes has come out with a limited edition that not only has sketch-friendly paper – its theme resonates deeply with me. It’s the Fall 2016 Lunacy edition, which celebrates the moon in all phases. Even if the paper had been mediocre, I would have used these just because I love the die-cut covers exposing the moon’s image printed on the flysheet, its “dark side” embossed on the back cover, and the lunar factoids inside. 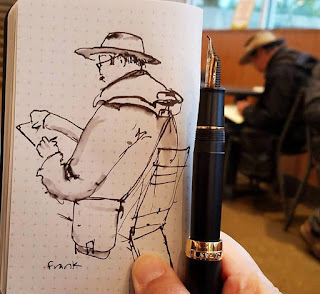 So you can imagine my joy when, after testing the 60-pound paper with all my usual favorite sketching media, it turned out that it’s almost ideal for the kind of casual sketches I put into this type of notebook. feathered or bled through Lunacy's 60 lb. paper. even where I applied water. Lunacy's sizing (left) is very similar to Workshop Companion's (right). 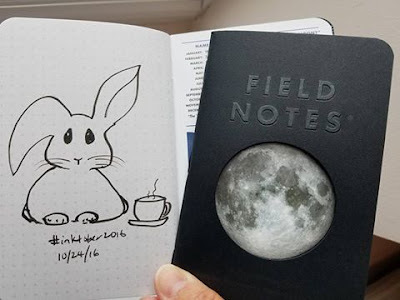 I say almost because blank would have been better than the reticle graph ruling (but I know I’m in a very small minority of Field Notes users who prefer unruled pages; most use them for writing, not drawing). And white paper would be my preference over pale gray (too pale to use for toned drawings, which the red Sweet Tooth paper is excellent for). Still, the reticle marks are printed with such low contrast to the paper that they’re very easy to ignore; I hardly notice them at all (I’m not even sure how effective they would be in helping someone write straight). sizing that allowed all my pens to bleed through. 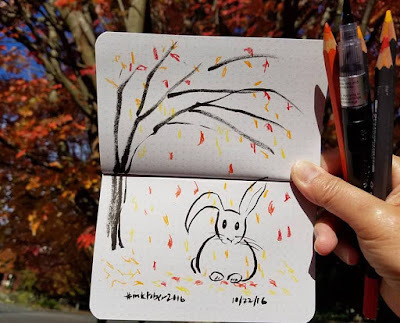 When I first started InkTober, I used another Field Notes book containing a very smooth 60-pound paper, but all my markers bled right through (reverse side of paper shown at left). So it was with some trepidation on my first day with a Lunacy that I scribbled with my juiciest fountain pens, brush pens and other markers. 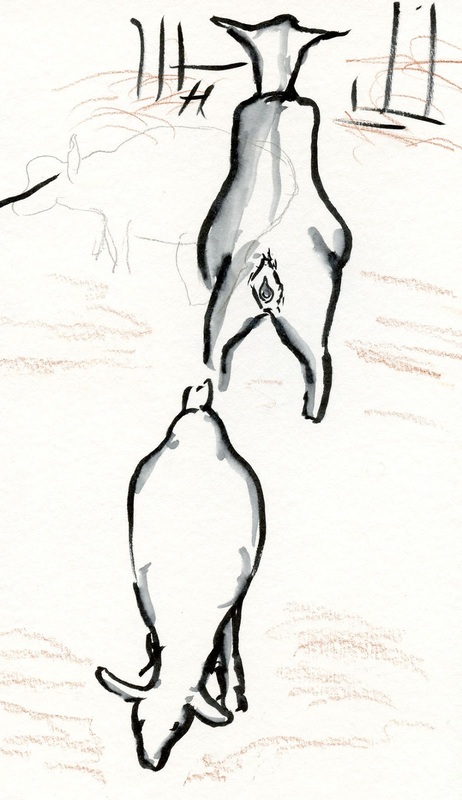 Lunacy’s paper took all my inks well – none feathered or bled through. I’ve come to learn that a paper’s weight is not nearly as important as its sizing. Then I gave it the ultimate test (for paper in simple notebooks like this, which obviously aren’t intended for wet media): I gave a few fountain pen lines a quick wash with a waterbrush. 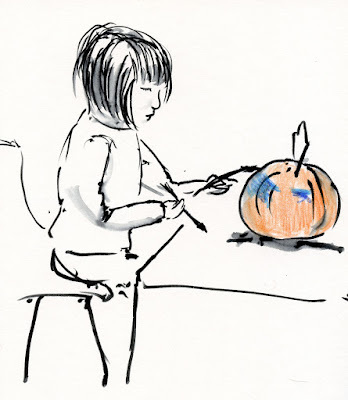 The ink not only washed beautifully – it still didn’t bleed through! The sizing compares favorably to Workshop Companion’s paper, which is actually an even heavier 70-pound weight. 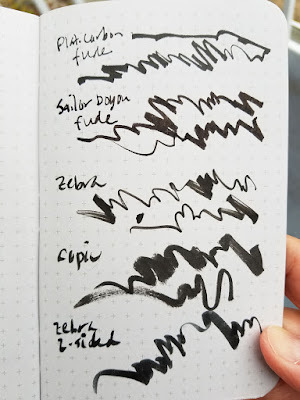 Sailor fude fountain pen ink line washed lightly with water. Lunacy's moderate tooth takes colored pencils beautifully. 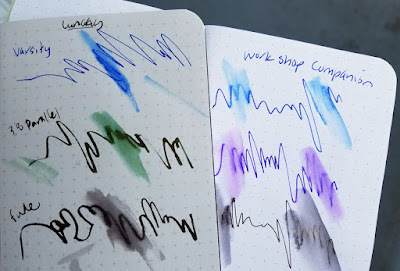 Although some fountain pen users might find Lunacy’s surface toothier than would be ideal, I have no qualms with it. 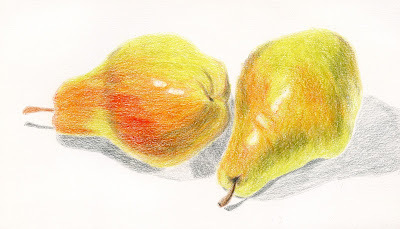 In fact, the bit of tooth takes colored pencils nicely (and probably graphite, though I’m not much of a graphite user). 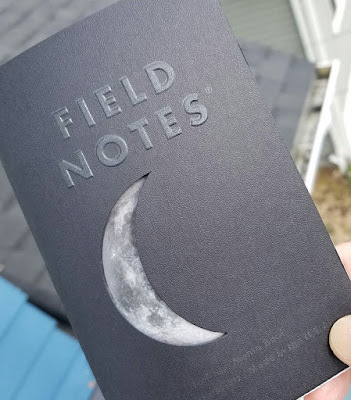 Now that I’ve finished filling my first Lunacy, I’m convinced that it is as close to being the perfect pocket notebook for my needs as any I have tried. Let the hoarding begin. In somewhat related Field Notes news, I was recently inspired by other creative Field Notes users who have disassembled and reassembled their notebooks to switch various covers and papers. 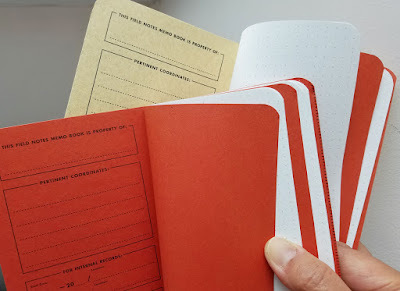 I enjoy having both a toned (red) paper notebook and a white one, but I don’t want to have to carry two books. So I took apart a Workshop Companion and a red Sweet Tooth, and I reassembled them with alternating red and cream-colored pages. When I’m not using a Lunacy (or the elusive bright-orange-papered EEEK Field Notes, another favorite but much harder to come by), I’ll use one of my hacked “Sweet Companion” notebooks. A couple of years ago I was ranting about how none of the Field Notes ever meets my sketching needs, and now I have several choices! My sketching life is indeed sweet. a second one -- this time with a full moon! 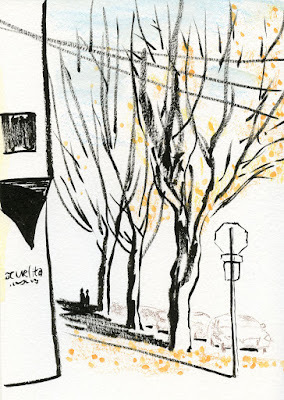 I’ve lived near Green Lake for almost 30 years, walked around it at least weekly year-round, and sketched there more often than at any other park (164 results came up in my Flickr photostream search of “Green Lake”). When I see the same things day after day, they sometimes become invisible. 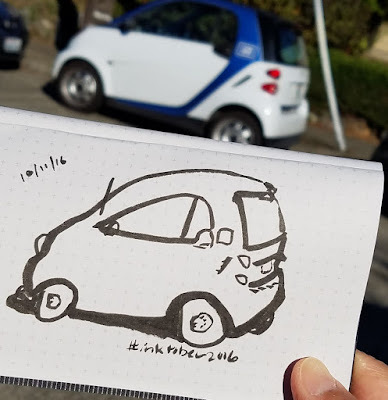 That’s what made this morning’s Urban Sketchers outing in the Green Lake neighborhood especially rich for me: I had the opportunity to see very familiar places and things through other sketchers’ eyes, and they became fresh for me again. For my own sketches, I seemed to have been in a tree mood. Suzanne and I both set our stools down near Starbucks facing the two rows of magnificent old trees leading from the street to the community center. 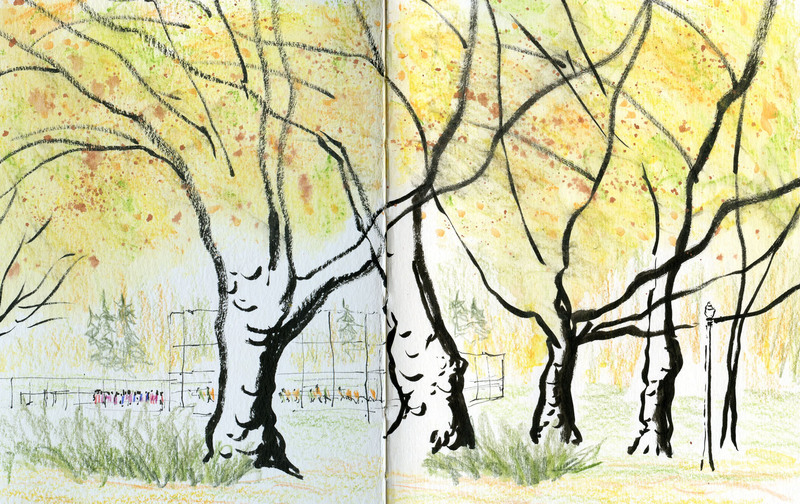 I’ve sketched those trees many times, but I never tire of them. This time I chose an angle with the playfield behind them. After that I walked to the street next to the La Escuelita Bilingual School, where the cherry trees had lost most of their leaves. 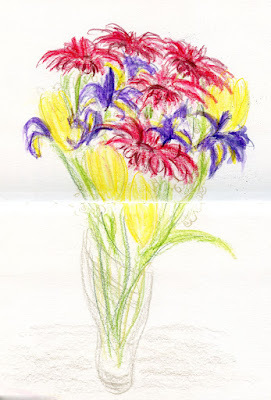 I was tempted to give them more color, but I am ever “truthful to the scenes I witness” (maybe to a fault). 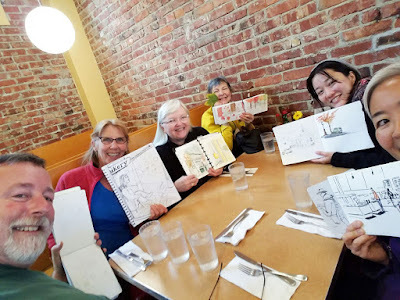 I forgot to take a photo of our sketchbook throwdown, but at least a couple dozen sketchers must have made it today. We lucked out with mild weather and even sunshine by noon! 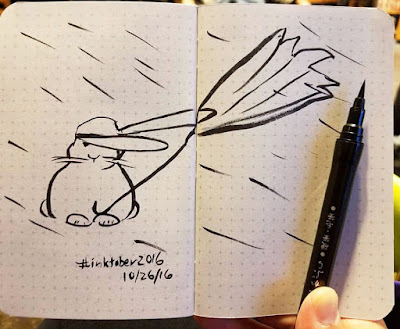 Three weeks into InkTober, I think my personal objective of making more sketches from imagination is finally taking hold. When I first started, I gave myself the theme of “adult coloring book,” thinking that would be general enough that I wouldn’t have to be tied to any specific subject matter. If I were sketching things I see in my daily life, I think that plan would have worked well. But it didn’t take me long to realize that when I’m sketching from imagination, having a wide-open theme with no specific subject is actually harder, not easier. 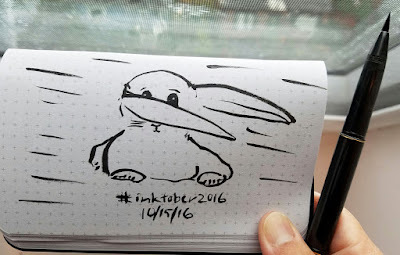 It became clear that other InkTober participants already knew this; I am seeing several working from very specific themes that probably make it easier for them to begin their drawings each day. 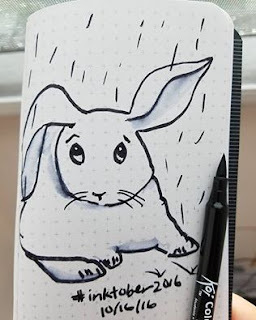 As it turned out, a theme emerged on its own when the cartoon rabbit I had drawn sporadically the first two weeks started reporting on our daily weather conditions last weekend. I’m going to continue letting Weather Bunny report the weather when he wants to, and when he doesn’t, he can report on his lunch! In addition, I’m discovering that the rabbits I drew as interpretations of photographs and the sketch I did yesterday at the Bruce Lee exhibit are another type of drawing. They are not fully imaginative, nor are they drawings from life. They’re somewhere in between in that I start with a visual prompt but have to let my imagination do some of the work while capturing nothing but the essence in a fluid brush pen line. Challenging in a very different way, this type of sketching is very enjoyable, too, and I plan to explore it further. See all my InkTober2016 sketches in my Flickr album. Always be yourself. Express yourself. Have faith in yourself. Do not go out and look for a successful personality and duplicate it. The Wing Luke Museum is now showing Part 3 of a traveling exhibition honoring Bruce Lee’s life. While the previous parts focused on his TV and movie roles and family life, Part 3 of “Day in the Life of Bruce Lee” is more about the man’s internal life. Through facsimiles of journals, poems, letters and daily planners, visitors gain an intimate glimpse of his philosophy, desires and self-improvement regimen as well as mundane to-do lists and appointments. Delicate drawings on wide-ruled school notebook paper and poems drafted on restaurant letterhead had an off-hand, bittersweet quality, as if nothing he put on paper was worth saving. 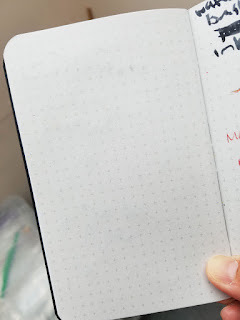 As a lifelong journal writer and daily planner keeper, I found it fascinating and slightly voyeuristic to peek at the handwritten pages of his Day Timer and small memo books that were similar to what I use myself. Particularly heartbreaking was a goals statement he had written through year 1980: Bruce Lee died in 1973 at the age of 32. Since the exhibit consisted of two-dimensional photos and ephemeral papers, I couldn’t find anything to sketch. 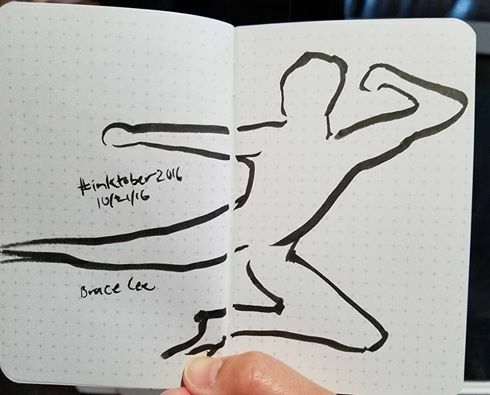 However, I used a brush pen to try to capture his iconic stance that was shown in an enlarged photograph on one wall of the exhibit. If you know what it is, then you’ll sympathize. Of course, the “prep” is the worst part, and mine happened to fall yesterday during the final Presidential debate. 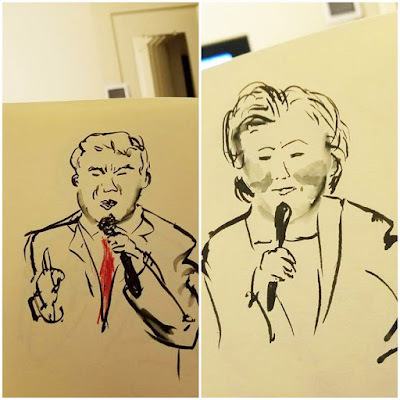 Knowing I would have to spend much of the evening there, I decided to set up camp with my laptop in one of our bathrooms so that I could sketch the candidates. 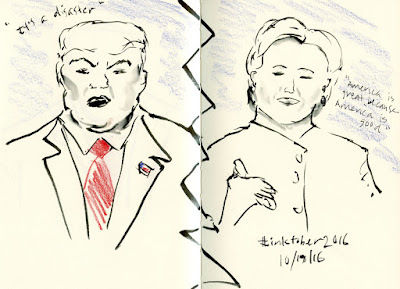 I also sketched the second debate last week. Unfortunately, we were eating dinner while viewing that one, and it killed my appetite. My GoLytely experience was more satisfying. Although our storm last weekend was lackluster compared to the Armageddon that the media had led us to expect, the wind was still strong enough to take down a lot of leaves (and even a few trees in some areas). This is the same aspen I sketched a couple weeks ago when it was still bright yellow. 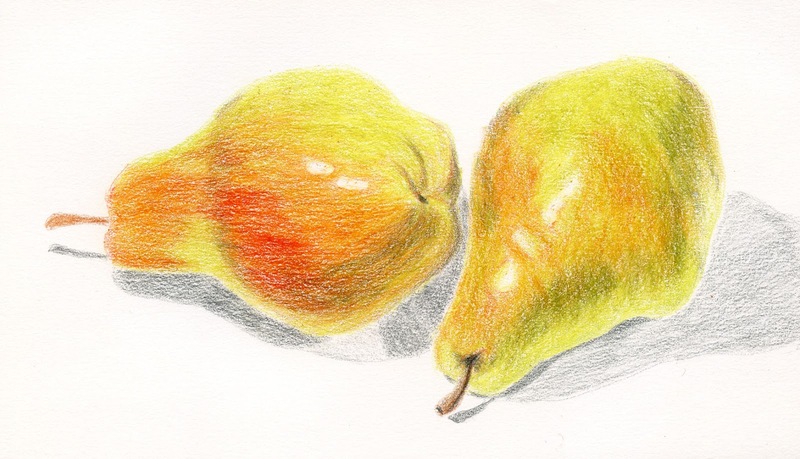 If you’ve seen some of the fruit and vegetable still lifes I’ve been doing in colored pencils lately, you know that my approach has been to be fairly tight and detailed. 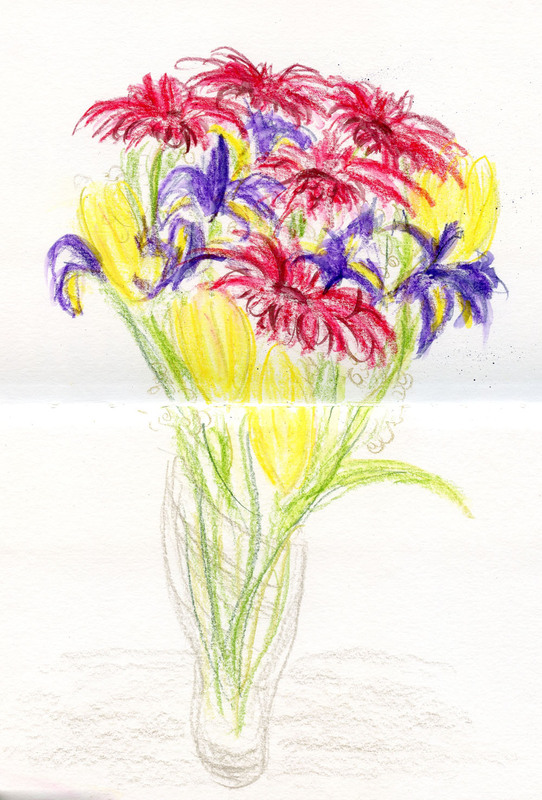 I enjoy that approach when using colored pencils with some subjects, but this bouquet seemed to demand a looser, more painterly approach. 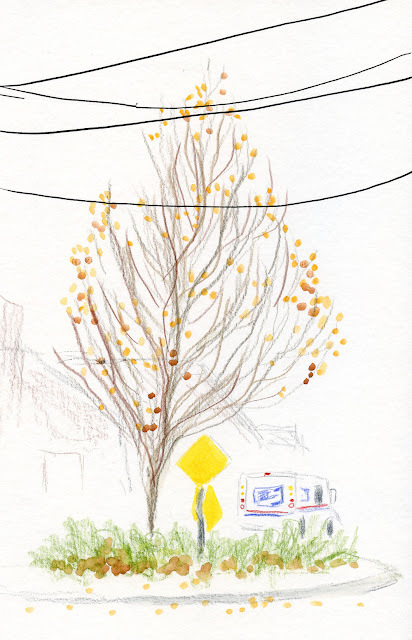 It’s harder to be loose with colored pencils compared to watercolor, but I like that I can have some control over the looseness (Contradictory? Probably). Our wedding took place at the top of the Smith Tower, which has always been one of our favorite buildings in Seattle. Years ago the Seattle Sketcher sketched the tower (it appears on the cover of his book), and I once asked Gabi Campanario if I could buy that original sketch. Of course, the sketch belonged to the Seattle Times, so he couldn’t sell it to me, even though the original was just sitting in a flat file in his office. Undeterred, I went directly to the Times and asked if I could buy it; I was referred to the reproductions department, where I could buy a print. A print might have been OK, but by then I had my heart set on owning the original. Fast-forward to a few months ago when I had noticed that Gabi was starting to sell both originals and prints of his personal work on his website. I decided I didn’t have to have the one that he had made several years ago – I would simply commission him to make me a new one! 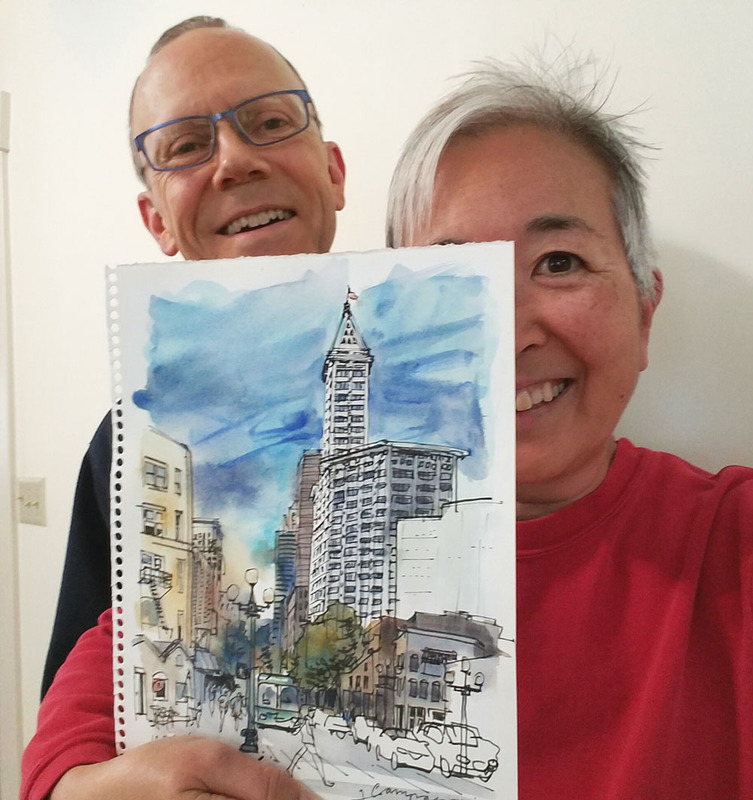 So I did, and just in time to surprise Greg with it on our anniversary, I received the beautiful sketch from Gabi. 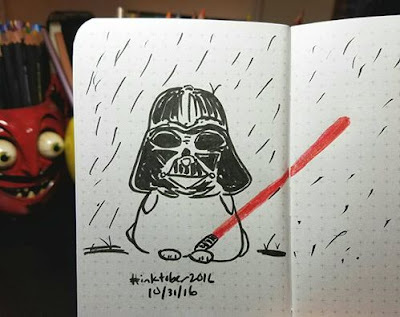 Week 2 of InkTober2016 is done, and it was something of a struggle for me. The early part of the week began well with a pair of gestural sumi-e-like sketches of a running rabbit inspired by photos on the Internet. 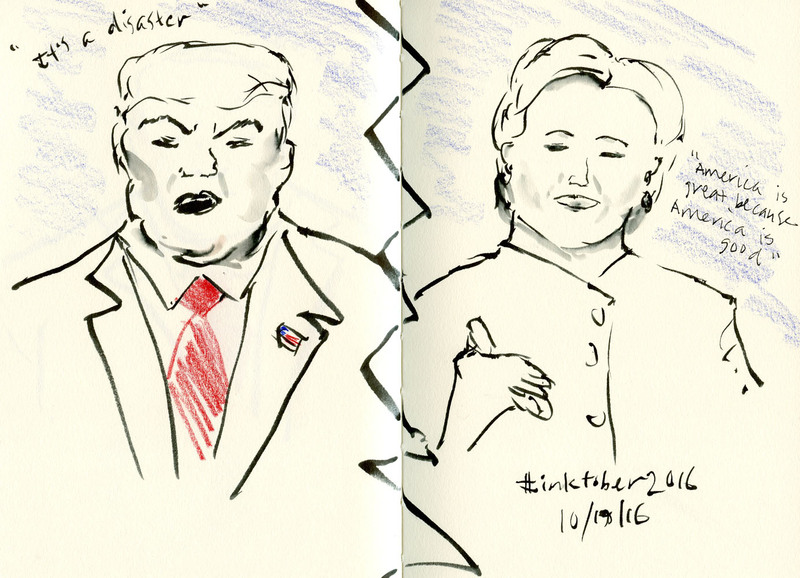 Then Sunday evening when I felt my blood pressure rise while watching the Presidential debate, I decided to bring it back down by sketching the candidates. 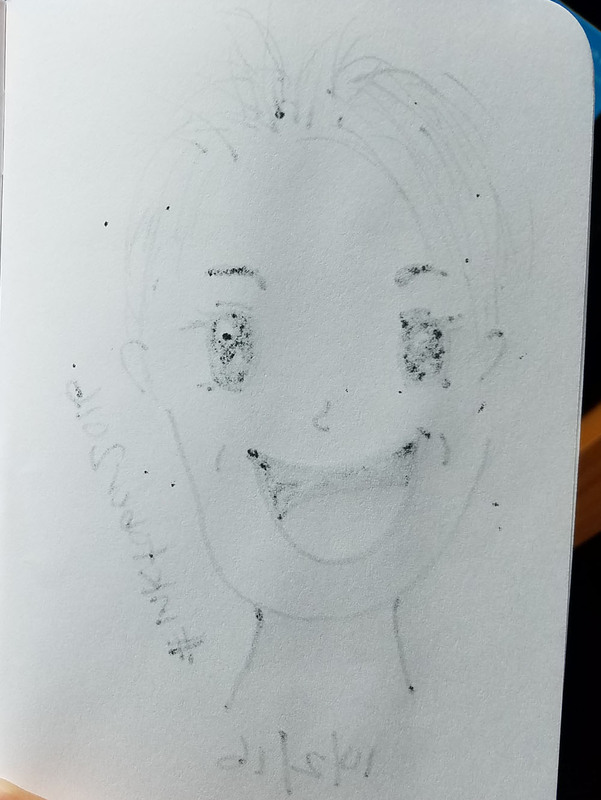 I felt much better immediately, and sketching from the TV was something I’d never done before, so it fit with my InkTober goal to try new challenges. But the next few days, especially when I was short on time, I found myself falling back on old habits again and simply sketching whatever birdbath or potted plant I happened to see. 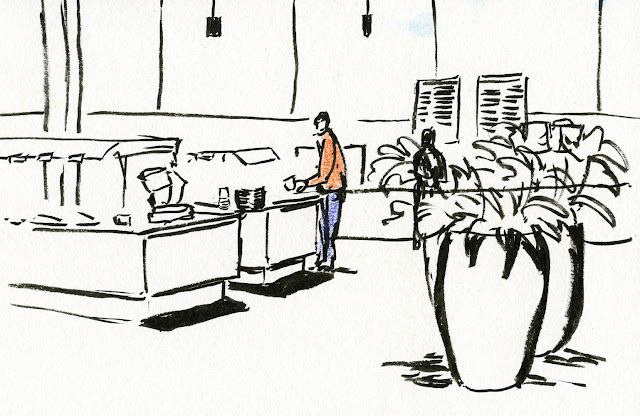 As an urban sketcher, drawing from life comes so easily to me that it’s almost second nature. I’m not saying the act of drawing itself is easy – that part is always a challenge on some level – but choosing something to sketch from life is the easy part and requires almost no thinking at all. On Thursday I gave myself a swift kick in the rear to get back to my goal of making imaginary sketches, and I kept at it through today. 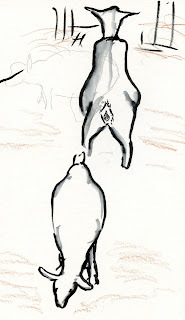 Sometimes I managed to conjure up an image in my mind and get it out on the page. 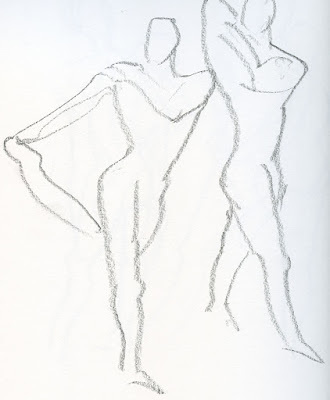 Other times when I had an image in mind but couldn’t quite get started with the sketch, I would search for photos on the Internet for something close, then work from that, which I found immensely helpful. I was reminded of the article by Jake Parker, founder of InkTober, talking about how it takes him the first 10 days to get past his “old tricks” before he can get to new and exciting work. I’m not going so far as to hope for “new and exciting,” but I am finding that every time I make a sketch from imagination, the next one is a bit easier. I’m looking forward to the second half of the month to see where it takes me. Here's the photo from the Internet that helped get me started in making the sketch above. Despite high-wind warnings and other predictions of a storm that could rank among the five worst storms in Western Washington history, seven hardy sketchers met in Columbia City – and several of them even sketched outdoors! Not me – I retreated to PCC’s café, where I sketched the salad bar. Shortly after I arrived, Frank Ching came in, so I sketched him. When we shared sketches over lunch, I was impressed by those who sheltered under awnings and in doorways – at least until the rain started pouring sideways – to capture the neighborhood. The worst of the storm is not supposed to hit until tomorrow afternoon, when I intend to be safely bundled up at home, flashlights and candles at the ready. Hope the rest of you locals are all safely indoors by then, too!